A Conversation with David Reed. 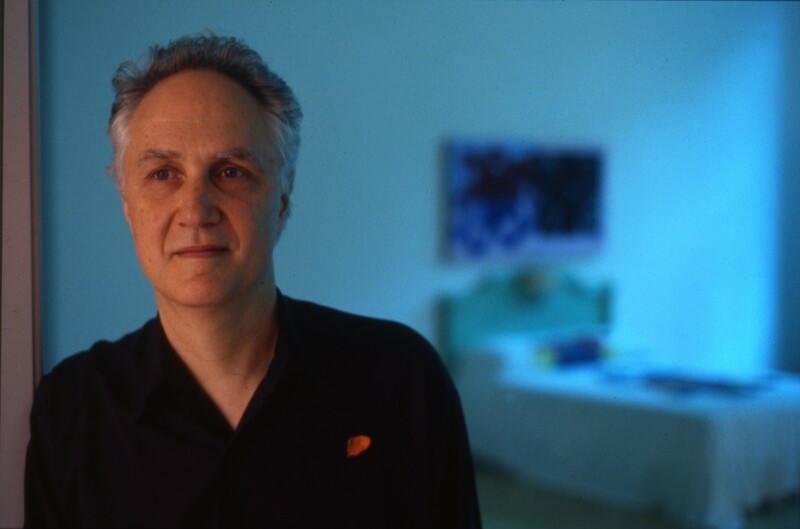 American painter David Reed, born in San Diego in 1946 is one of the most important abstract painters of his generation. Living in New York since the 1970s, he had his last big European museum survey show in Bonn’s Kunstmuseum in Germany in 2012. Here, he displayed his painterly skills, the meticulous preparations and the inspirations that inform his work. David Reed’s seemingly spontaneous, gestural and dynamic, colorful paintings are strategically developed in countless studies and so-called “Working Drawings”. His work, oscillating between spontaneous gesture and conceptual focus is developed from sheet to sheet and from canvas to canvas. The painter methodically counteracts blank areas with transparent brushstrokes. 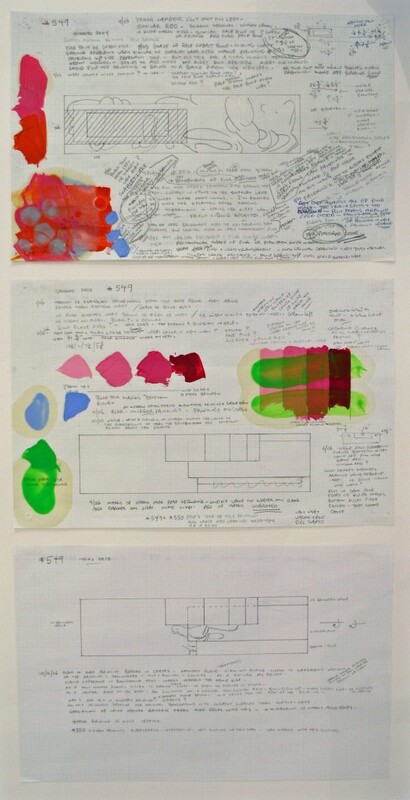 In the process of creating a work, he rearranges his trademark elements many times over, discards them, and starts anew. 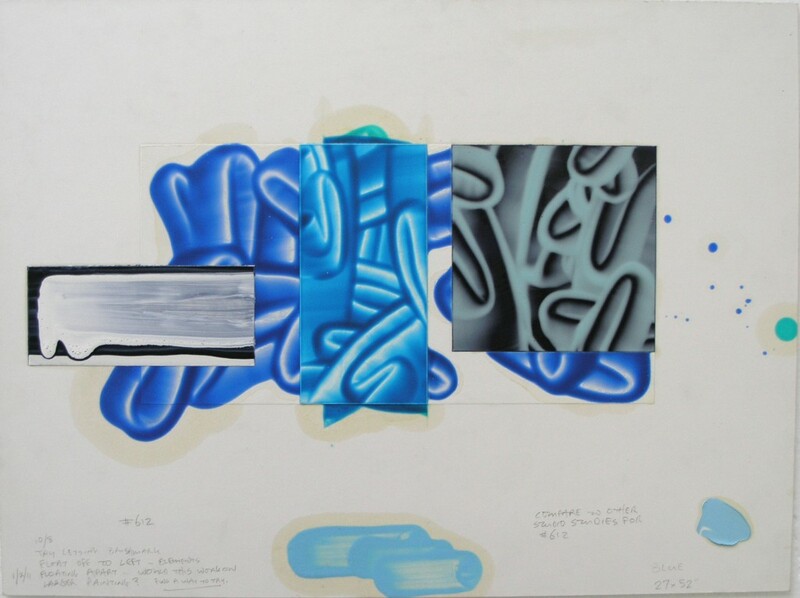 His paintings explore the uncanny, forming realms of tangible abstraction as legible and cryptic as the city’s graffiti. Magdalena Kröner: Cologne art dealer Rolf Ricke introduced you to a German audience in the 1990s. How did you meet? David Reed: In 1988 my former art dealer in New York, Max Protetch, suggested that he bring a painting of mine to the Cologne Art Fair to see if we could get something started in Europe. I sent a vertical black, white, and red painting (#264, 112 x 28 inches, 1988). Max proudly told me that the painting had a good location in his booth. Actually it was a bad spot – outside, on a back wall. But I was lucky – the painting was across the aisle from Rolf Ricke’s booth. Rolf looked at the painting for three days and decided that he liked it. When he saw Max talking with another dealer, trying to convince him to show my work, Rolf rushed over and pointed to my painting saying that he wanted to show this artist. Rolf didn’t yet know my name, my age, whether I was a man or a woman, or where I was from. He had only seen that one painting. When he next came to New York, Rolf then arranged to visit my studio. MK: So how was your first experience with Germany then? DR: In 1989 Rolf had a jubilee exhibition, celebrating 25 years of his gallery, at the Kölnischer Kunstverein. When I took a cab from the airport to my hotel, my first time in Germany, we happened to pass the Kunstverein, then on Cäcilienstraße. Somehow the building seemed like it might be involved with art, so I looked in from the street as we passed. Through the windows I saw my painting, a long horizontal, behind a Don Judd floor sculpture. I was, of course, pleased and thought that Cologne was a city for me. MK: And did Germany love you back immediately? DR: Well, to be honest, I only learned the answer to that question much later, during my exhibition in Bonn last year. Rolf and I walked through the show and I was surprised when he told me about the many difficulties he had in creating interest in my work. His collectors at first did not understand my paintings at all. There was resistance to the strong color and to the non-tactile surface. Viewers thought my work must be fabricated or produced photographically – not real painting. DR: Thank you. Yes, I am lucky. Some artists are intrigued. I have enjoyed studio visits in Cologne and became friends with a number of the artists I met. Before my first opening at Rolf’s, I visited Jürgen Meyer in Düsseldorf and saw hundreds of his paintings in his rough industrial space out flat and drying under sheets of plastic. Just last week, while I was installing my show at Galerie Schmidt Maczollek, Klaus Merkel came by. We have known each other for years. I have carefully followed his work when I traveled to Germany, and he has come to my studio in New York. We have a dialogue that is very helpful to me. And I’ve met artists through my work. Laurie Parsons, an American artist, who showed with Rolf, came to my first opening in Cologne because she had a show at a nearby kunstverein and we became friends. Before my first show, Rolf told me that Gerhard Richter saw a painting of mine over the desk in his back office and asked how the painting was made. Rolf invited him to join us for a quiet dinner in Rolf’s apartment. We argued about who was better, Matisse or Picasso. I had just seen works by the two of them together after the Matisse retrospective at the Museum of Modern Art in New York. Later during a group show in Stuttgart, a friend of Sigmar Polke’s told me that Polke had some technical questions about my paintings. I said that I would reveal everything but that I would love to visit Polke’s studio and ask a few questions myself. I never got the studio visit…(laughs). I was stupid of me to make a condition. MK: One of the first things that made your work accessible for me was a little anecdote that you like to tell about your work…the one where you were painting in the Southwestern desert as a young man and something strange happened… I always wondered if that really happened? DR: Yes, I think I know the story you mean and it did happen. In 1967 and 1968 I lived for the summers near Oljato on the Navajo Reservation. I wanted to paint that landscape and do it directly, out in the open. I nailed an easel to the side of my car and drove to different locations to paint. Once, while painting a view near Monument Valley, I noticed a cave on the side of a mesa and decided to go there to escape the heat, the sun and imagined snakes. Inside the cave there was a spring, water dripped down the side of a rock by the entrance. As I cupped my hands to drink and looked out of the cave, I had a déjà-vu experience. The place felt eerily familiar. Sometimes during that summer I had thought that I was the reincarnation of a Native American and also thought that I had deep spiritual connections to the landscape. In the cave I felt that I had experienced this moment before, had been in the cave before, or had dreamt it. It wasn’t until several years later, when I saw a restored version of John Ford’s western, “The Searchers”, that I realized what had really happened. The cave is a location in that movie. I knew the place from the movies. MK: For me this anecdote made it possible to understand many aspects of your work, such as the influence of media and mediated experience and how you immediately translate that into your work. It makes many of your trademark painterly elements legible in an essential way: the contrast between gestural movement and absolute stillness; the contradiction of emptiness and abundance in your work or the cinemascope format you preferably work in. Why was this moment important for you? DR: My experience in the cave made me understand that I was more influenced by film and photography than I had ever consciously known. I thought of it as a media Baptism. Later, when, without my intending it, the surfaces and color of my paintings started to look photographic, I remembered this experience and better understood what was happening. I decided I had better take this connection to film and photography seriously and work with it. I needed to translate my experience not only into the colors and surface, but also the structure and content of my paintings. I found that I was better off thinking about focus, pans and close-ups, flashbacks and movement. Not traditional painting composition. MK: I would like to learn more about the consequences of that process of change and transformation and how transformation influences your work. I am always astounded by the immediate, almost effortless sensation a viewer gets from your paintings, with their strong gestures, the permeating, bright colors and the clear shapes. DR: I initially went to the desert to paint the big space which I related to the Abstract Expressionist painters such as Jackson Pollock, Mark Rothko and Barnett Newman. I sat with my back against my shack and looking out across the desert at the sky, imagined floating paintings, becoming larger and larger. I loved Mondrian’s paintings, and other modernist works, but those paintings would burst as they expanded too much into the sky. Only the paintings by the Abstract Expressionists could expand to fill the whole sky: there was a relation between the big space and the open, endless space in their paintings. I read that as a teenager, Pollock was a trail guide in the Grand Canyon, so I decided that the Grand Canyon was the home of American painting. MK: That’s an interesting relation because I also could not help thinking how much your work of that time related to the European Fauves and their interest in color and the translation of sensual impressions rather than factuality. They did want to paint what they felt looking at something, not what the reality actually looked like. DR: When I painted or drew the sunset, I wanted to show a hundred miles of color, from the horizon to the light reflected on my hands. I wanted to not just paint the view but to give a sense of standing on the earth and feeling it revolve under my feet, how my body was moving through the changing light. After my “baptism” experience, I realized that I did not go to the desert to experience the sublime, the big space of Pollock and the other Abstract Expressionists, but also to experience the uncanny or the fantastic – an experience familiar from media. In films, appearances aren’t what they appear to be. The camera lingers and we know that the surface of what we see is not what is really important – something else is going on. MK: I also feel that the element of time is very vital in your work. DR: Definitely. I want to put time back into abstract painting. I hate the idea that painting is timeless. This removes painting from our world. Paintings are not, in any sense, outside of history. And the content of a painting is not immediately available. If a painting is to be meaningful it needs to be a part of our life and how we live. I want a painting to be in the same room that I am in, and to be experienced in changing ways over time. MK: But isn’t immediate punctuation of a moment something that is especially true to photography, in the way that it eliminates the passing of time and freezes it into a singular moment, a singular image? DR: That’s true, but photography has time built-in in other ways. The edges of a photograph always imply a sense of extension, never a closed border. The edges of a photograph always imply the surrounding world. I would like my paintings to work that way also. MK: Is the idea to enable your viewers to see your work over time something that prompted you to show your studies and working drawings in Bonn? DR: Yes. The way a finished painting of mine looks is not how it was initially conceived. In each painting, while it is in progress, there are a lot of decisions, steps moving forward and back, changes of structure and color. Sometimes large areas are sanded off and repainted in a completely different way. Sometimes, even after a painting is “finished” and shown, I go back into it again. In each painting I want to discover something new, be truly surprised. The paradox is that the surfaces of my paintings hide much of that working process and the thinking that goes into the making, so the final paintings seems preplanned in some way. In Bonn I showed the drawings because I wanted viewers to be aware of the complex, changing decisions that go into making each painting. MK: To be able to look at your drawings enabled people to realize the tension between the seemingly spontaneous gesture and the meticulously calculated and painstaking ways your paintings are executed. I would like to know more about that. How did that unique tension evolve in your work? DR: In the mid 70’s, back in New York after my time in the desert, I tried to be as direct as I could be about what I was doing and show the process clearly. I painted repeated brush marks, wet into wet, on tall thin canvases, going over each canvas once, starting at the top and finishing at the bottom. I was inside the painting and aware while making each mark, and also outside of the painting, aware of how each mark fit into the whole. This split in my consciousness was painful so I made these paintings quickly. As I pulled the paint across the canvas, one brush mark under the other, I could see gravity pulling paint downward and the surface becoming continuous. These paintings only took a minute or two to make, but those few seconds of intensely watching how the surface moved, transformed how I thought about painting. The moving surface froze the brush marks and changed them into something else, something I hadn’t expected. It took me awhile to realize that this frozen surface related to media. Looking back I can see that something similar happened to other painters at the time. 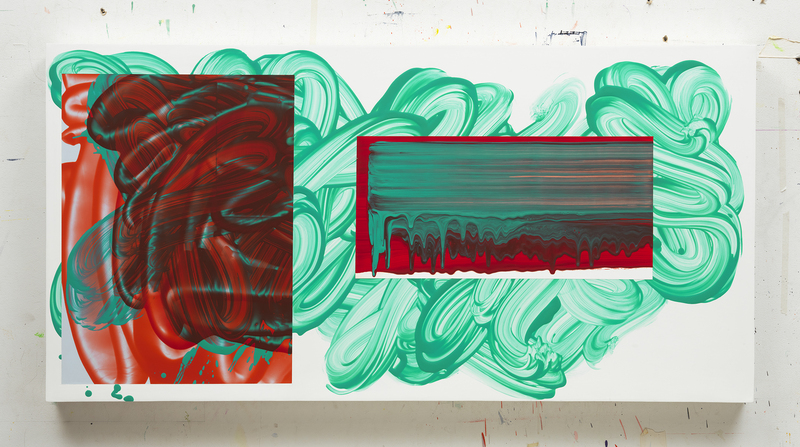 Jack Witten, a New York colleague, wanted to make a whole painting in one gesture, so he created a device for pulling paint that he called his “developer”. His use of this term shows that he was more conscious of the relation to photography than, at first, I was. Gerhard Richter also was, I think, more conscious of the relation of his paintings to photography. It took we awhile to figure it out. I think it is wonderful that painting is able to absorb such a change and that it led me in a direction I never expected. At that time we were experiencing so much more media, especially TV and movies. I wonder if this would have happened to painting at any other time in history. MK: How did going from California to New York in the 70s influence your work? I feel that there is a lot of “West Coast” influence in your work but also a lot of “East Coast”. DR: I went to New York because I was impressed by the painting of the Abstract Expressionists and wanted to figure out for myself the meaning of their work. At the Studio School I studied with Philip Guston, Milton Resnick and others from their generation in order to connect to that history. Once Willem de Kooning came to the school. Morton Feldman was the dean. I saw exhibitions of Franz Kline, Mark Rothko, Clifford Still, and Willem de Kooning. I especially loved Barnett Newman’s paintings and had to argue and defend his work. New York at that time was an open city for painting and young artists were coming from all over to be part of this investigation, hoping to find the next possibilities. At the time, there was no such scene for painters in Los Angeles, let alone San Diego, where I grew up. Going to New York made absolute sense. MK: Did you ever feel the desire to relocate? DR: Yes, all the time. I feel expatriated in New York! My color sensibility comes from growing up in California and painting in the desert where the light is so different from the light in New York. Sometimes I feel that the color in my work is not understood in New York, especially now since the color in my paintings is also influenced by media. I miss California and often dream about returning. I wonder what it would be like to paint there. David Reed’s work is on show at Schmidt Maczollek Gallery, Cologne until Dec 20.